The Punjab government has also ordered suspension of services on mobile internet, besides all SMS services and dongle services provided on mobile networks, except voice calls from 5 pm today until 11 pm tomorrow, an official said. The call for an all-India bandh on Monday by various Dalit organisations, to protest against the Supreme Court’s order banning automatic arrest and registration of cases for alleged harassment of Scheduled Castes and Scheduled Tribes, has put the Punjab government on toes as the 32% of the state’s population consists of SCs. The Captain Amarinder Singh-led state government announced that all public transport services would be temporarily suspended for the day. Educational institutions will remain closed and mobile internet services will be suspended in the state. While the CBSE exams will continue at selected centres, PSEB practical exams will be rescheduled. 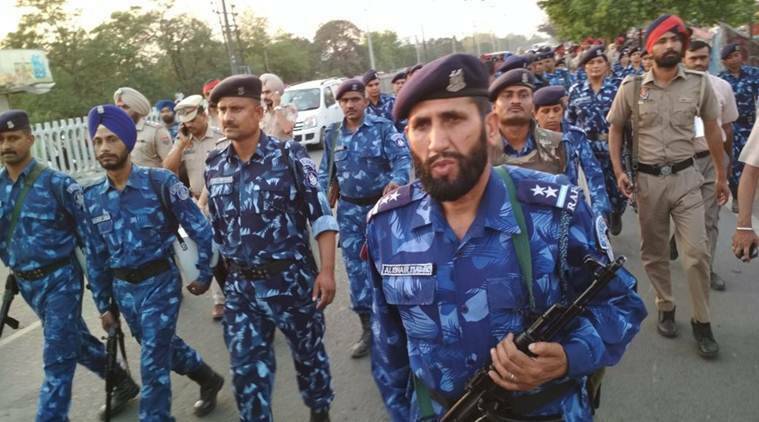 A large contingent of police force has been deployed at various parts of the state and the Army has also been roped in. Punjab Chief Secy Karan A Singh, in a letter to the Secretary, Dept of Defence, said, “Army in Punjab to remain ready for any eventuality as state govt may need their assistance in maintaining law and order,” reported ANI. The state government has also ordered the suspension of services on the mobile internet (2G/3G,4G/DCMA), besides all SMS services and dongle services provided on mobile networks, except voice calls from 5 pm today until 11 pm tomorrow, an official said. Chief Minister Amarinder Singh has appealed to the Dalit community to maintain peace and harmony in the state. Noting Punjab had the highest population of Scheduled Castes in the country, constituting nearly 32 percent of state’s population, a statement issued from the CM’s office, said that his government “accords the highest priority to ensure their all-round welfare and committed to safeguard their interests”. Meanwhile in Mumbai, protestors had earlier said that a symbolic march would be carried out from Dadar’s Kotwal Udyan to Chaityabhoomi on the day of the bandh. WHY ARE THE DALITS PROTESTING? The apex court’s verdict is seen as diluting the Scheduled Castes and the Scheduled Tribes (Prevention of Atrocities) Act, 1989, which protects the marginalised communities against discrimination and atrocities. The order has sparked fears that it would lead to increased discrimination against the STs and SCs. Contending that there was a “rising sense of insecurity” among Dalits and other backward classes after the apex court verdict, various Dalit outfits joined hands on Saturday to raise a call for a Bharat bandh on April 2. On Friday, representatives of the outfits who have declared support to the protest met in Dadar to discuss plans for the protest. The protesting groups argued that a decision to hold the Bharat bandh had been taken after the BJP-led government did not respond to the demand for seeking a review of the SC judgment. Political outfits – the Prakash Ambedkar-led Bharip Bahujan Mahasangh, the Peasants and Workers Party, the Janata Dal, and the Communist Party of India – and Left-backed unions including the Centre of Indian Trade Unions have come out in support of the protest. The Rashtriya Seva Dal, the Jati Aant Sangharsh Samiti, the Sanvidhan Sanvardhan Samiti, and National Dalit Movement for Justice, among others have also joined the protest. The Indian National Congress has also decided to extend its support to the protest against the apex court verdict. In its review petition to be filed in the top court on Monday, the Ministry of Social Justice and Empowerment is likely to say that the SC order will weaken the provisions of the Scheduled Castes and the Scheduled Tribes (Prevention of Atrocities) Act, 1989, sources in the government said. The ministry could also plead that the latest order would reduce the fear of law and may result in more violations, the sources said. “The review petition against the judgement will be filed positively tomorrow,” Union minister Ravi Shankar Prasad said on Sunday. A delegation of NDA’s SC and ST MPs, led by LJP chief Ram Vilas Paswan and Union Social Justice Minister Thawarchand Gehlot, had last week met Prime Minister Narendra Modi to discuss the apex court’s judgment diluting provisions of the SC-ST atrocities act. Mr Gehlot recently wrote to Mr Prasad about a review plea against the Supreme Court verdict. He noted that there were concerns that the order would make the law “ineffective” and adversely impact dispensation of justice to Dalits and tribals.